Between feeding the kids, managing the carpool schedule, and getting ready for work, mornings are always stressful. So losing your wallet or keys can turn a busy morning into a full-blown mess! De-stress with Rinex's Bluetooth key finder! This handy little tracking device helps locate your missing valuables, so you can confidently take on the day. Most tracking devices are complicated and confusing. Optimize your time with a straightforward tracker that locates your belongings quickly and effortlessly! 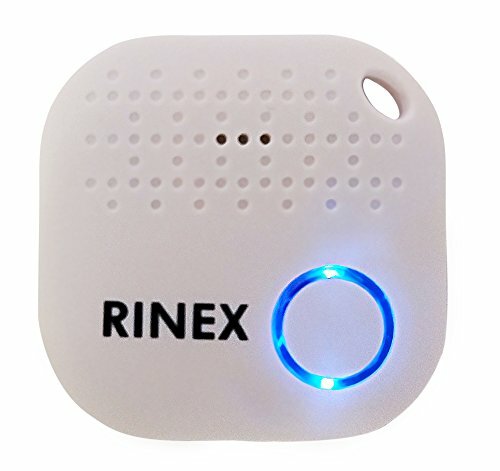 The Rinex locating device is simple to operate, so finding your lost valuables is easier than ever. When you lose an item, just log into the app. It'll sound the alarm, flash an LED light, and show you its exact GPS location. Whether day or night, you'll be reunited in no time! Your key locator device arrives with a FREE comprehensive manual and completely ready-to-use! Plus, you'll be able to enjoy item finder powers for over a year without worrying about charging, thanks to the already installed, low-energy battery. Why let your purses and keys have all the fun? Use your tracking chip to find your missing phone. Simply press the button on your tracker and find your smart device in seconds! When you're out and about, keeping your kids and pets in eyesight is no easy task. Make sure they're never lost or stolen with our GPS tracker! When your loved one travels outside of the effective distance range your phone will notify you, ensuring security wherever you go. After the end of a long day of travel, the last thing you want to deal with is a misplaced bag. Make locating your luggage simpler with the Rinex tracking device! Stop wasting time and energy searching for your lost items, and add a Bluetooth Key Finder to your cart TODAY! Connects with your mobile phone to locate children / love ones easily using a small green tracker. If you have any questions about this product by Rinex, contact us by completing and submitting the form below. If you are looking for a specif part number, please include it with your message.